Turns out that 'blocking' is one of the most important steps of any knitting or crochet project to make your items look 'nice like in the picture'. So, I have been committing the ultimate woolly crimes.....I still to this day have never checked my gauge, nor done a swatch (to redeem myself I rarely make anything that actually has to fit).......but I had actually been blocking my work, just didn't know the correct terminology, and had been using an unorthodox method. 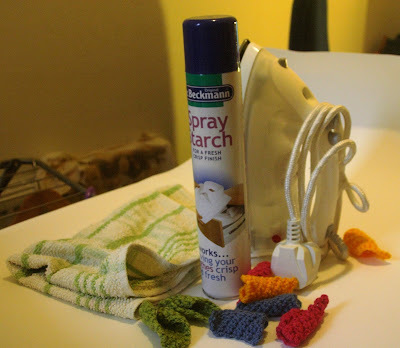 I must say that my method is only suitable for small items, such as bunting or for individual pieces of a toy before sewing together (I always find it is much easier to sew toys together once they are blocked as it is way easier to match stitches up and make the finished item look neater). 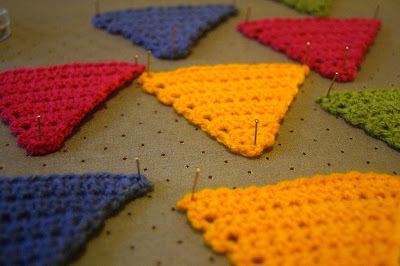 This is my method for bunting for example, or anything that could do with being a bit more sturdy. I wouldn't use this for a toy as it would loose some of its cuddliness. So.....see these triangles of crochet fabulousness here.....sorry....I mean strange shapes all curled up at the corners.....these are my bunting triangle pre-blocking (I will write up the pattern for these soon). It is very important that you don't hold the iron down very long. 5 secs at a time max, otherwise you risk squashing/melting your work, especially if you are using acrylic. 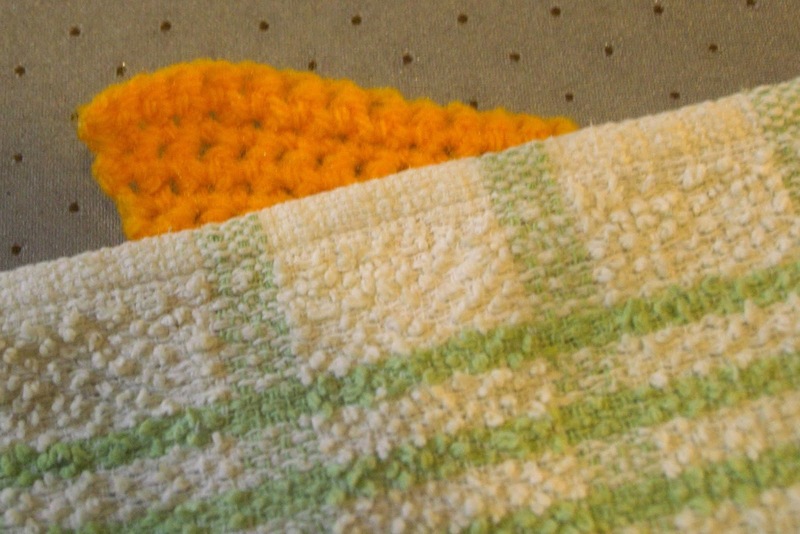 Keep on pressing until your work stays flat when you remove the t-towel, but please please please not long enough to burn it. 7. Pin into place stretching out the corners. I just do this straight into the ironing board foam. 9. Voilà! 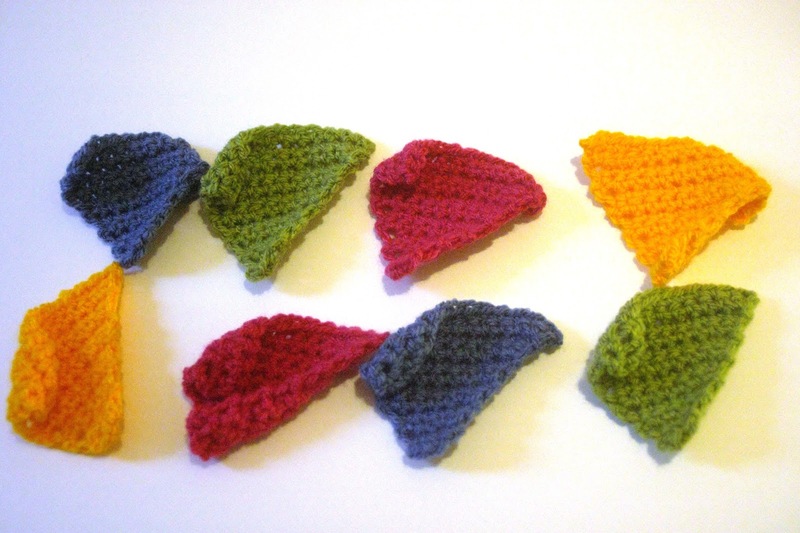 Lovely flat, slightly stiffened, triangles ready to be strung into bunting! p.s When I am blocking component parts of a stuffed toy for example I just iron lightly on reverse through a damp t-towel. The pieces are then ok to be used straight away! See the difference yeah? The advantages of blocking are really obvious.....so no excuses ey! I hope this is useful for someone. Anyone else have any tips on blocking?